Both the Turnbull government and the Shorten opposition are committed to 'stopping the boats'. Tony Abbott's mantra is now the political orthodoxy on both sides of the political aisle in Canberra. Labor knows it has no chance of winning an election unless its commitment to keeping the boats stopped is as firm as the government's. "The boats are stopped, not because refugees on Nauru and Manus Island are being treated badly but because the diplomatic arrangements with Indonesia are in place." Quaedvlig told Fairfax that the US might be convinced to take more refugees 'if the uplifts and settlements go smoothly'. Meanwhile Dutton says, 'I don't want to see anyone on Manus or Nauru. I want them off and we've brokered a deal with the US to take 1200 people. There are no other third countries who are immediately available. That's the reality.' But there is another third country available: New Zealand. All three of New Zealand's recent prime ministers have offered to take 150 refugees a year from the Pacific camps. When New Zealand has dealt directly with PNG repeating the offer, Australia has vetoed the suggestion on the basis that refugees resettled in New Zealand would be able to travel without a visa to Australia. Dutton continues to argue that this could send a message to the people smugglers. That was never a problem for John Howard when he accepted a similar New Zealand offer. The boats did not start up again. At the Senate Estimates hearing last year, Air Vice Marshal Osborne, Commander of Operation Sovereign Borders Joint Agency Task Force, said, 'Our ability to detect, intercept and turn back people smuggling boats is stronger than ever. We have a committed and highly capable civil maritime surveillance and border security response fleet with access to the combined resources of the Australian Border Force and the Australian Defence Force.' At the Senate Estimates hearing last week, he told the Senate: 'Our figures have not changed since the last estimates. We've intercepted 32 vessels' since 2013 carrying 800 persons. For the good of the refugees who have languished for five years on Nauru and Manus Island, and for the good of the Australian body politic, it's time to put an end to this inhumane chapter in Australian history. Keep the boats stopped. Bring New Zealand into the mix now. Empty the camps. And fight your elections on matters of substance which don't impose untold harm on defenceless children. Both Messrs Shorten and Turnbull need to acknowledge that Ged Kearney is right. Our government, and opposition, consists mainly of privileged white men whose background is as far from a refugee's existence as possible. We can hope that in the future our government consists of men and women who can really relate to being in a position of utter dependence. I'm unsure if I totally agree with Frank's penultimate sentence "And fight your elections on matters of substance which don't impose untold harm on defenceless children." It's a good and great statement but I'm not sure what "matters of substance" means. Thank you Frank for - once again - picking a clear path through what seems often to be impenetrable ground for the rest of us without the ability to sift and organise the facts in this way. I am especially grateful for your highlighting the exact spot where a specific 'point of difference' between the major parties may be identified. It helps to know just where to apply pressure effectively in an election run-up. Linda Burney claimed the transcript was not doctored, but that the omissions were a result of 'an honest mistake' by office staff. Given that any textual modification would so easily be found out, I rather hope there _was_ an honest mistake made. Not because the alternative betrays a flexibility of attitude towards the truth - I think we're all quite used to that - but because otherwise we are left having to admit that a politician might feel the electorate was stupid enough to swallow the 'honest mistake' line, if (when?) in reality this were a deliberate attempt at blurring what was said post-interview. Thank you once again for reminding us of the inhumanity of this issue. I can't for the life of me remotely imagine what these refugees are going through. I suspect that with climate change on the horizon , the refugee issue with people from the Pacific Islands will become a flood , maybe within our lifetimes. When will we do then? That's an accurate article Frank and you are dead right. Both Manus and Nauru detention centres are a disgrace - as is Dutton's head prefect point scoring attitude. More worrying still are the illegals overstaying their visas with China always topping the list. By Sarah Whyte SMH 26 December 2014 "People from China, Malaysia and the United States were the highest number of visa overstayers in Australia in 2013, with the Chinese topping the list at 7690. According to an Immigration Department report, Migration Trends 2012-2013, visitors (44,800) and students (10,720) were the largest cohort of visa holders to overstay their visit. The highest number of visa overstayers in 2013 by nationality came from China (7690), Malaysia (6420), the US (5220) and the UK (3780). And from Courier Mail Jan 2018: MORE than two thirds of the 64,000 who came to Australia on legal visas and have overstayed have been living here for more than two years. Illegal boats Border protection shouldnt be the Governments sole focus despite its high profile. Illegal Chinese infiltrating our cities is a far more pervasive and insidious problem. And very little is being done about it. It doesnt fit with political posturing. We lease our ports to them, sell our resources and mines to them. We sell our farms to them. What we did to the Aborigines the Chinese will soon do to us. And perhaps it will serve us right. And since we are on the subject of statistics, the illegals on Manus and Nauru only represent 3 percent of the problem. Thanks Fr Brennan; you are of course quite right to point out that both of our main parties have essentially the same policy, and in spite of Ged Kearney`s "dog-whistling" to the Labour-left and Greens. The NZ option is now the only difference and is probably inevitable. But don`t we also need to avoid getting into this ever again. The naval action is a very blunt and expensive exercise and we need to get back to the Gillard proposal for off-shore processing of refugees for admission to Australia. This eminently sensible policy option was destroyed by an unholy alliance of Abbott in opposition and the Greens, essentially just because they could; to be difficult and deliberately obstructionist; and for base politics of easy votes. Lest we forget! Australians ! Stand up and be counted.protest against imprisoning refugees, when no crime has been committed...except searching for freedom! . What a disgraceful slur on our country! This goes against our democracy. I demand along with millions of other Australians,that we uphold refugees, the world over, to a dignity,and safety we ourselves would expect!A decent life in a free country. Shame on our Government! Thanks Frank for your rationality and compassion as ever. I will spell out what you were politely hinting at when you speculated on a possible political reason for the Govt keeping the camps going endlessly- that it is a readymade wedge in place, ready to divide the Labor Party at any convenient time. Look how quickly Dutton stepped in to exploit the internal Labor vulnerability exposed by Jed Kearney’s maiden speech and Linda Burney’s Sky TV interview in support. I think Quaedvlieg, basically a decent man, is well out of that snake’s nest called Border Protection. What is awful is how so many Australians have gotten used to a horrible situation of permanent detention for people, including many children, who have done nothing wrong. It stretches on endlessly, with only the forlorn hope for some few of possible eventual US resettlement. These kids are spending their whole childhood in detention. The best years of these young men and womens’ lives are being wasted in detention. We have become so brutalised a country that we as a whole nation shrug this evil deed off. The cartoon expressed it perfectly. I wish I had hope but I cannot see it. At least we have stopped leaving people to drown at sea - that was a line most of us wanted to step back from, and Abbott and Morrison and Molan realised this. I actually despise Turnbull and Shorten for not resolving this today together, as a legacy issue from past policy errors. It would be so easy for them together to wordsmith a safe non-precedental solution for these 1600 victims , if the will and compassion were there in both men. Sadly, it is not. Greg Barnes's article in today's Hobart Mercury precisely sums up the scandalous mess that Australia has got itself into. Thank you Frank for what you have written. Ged Kearney’s maiden speech in parliament offered a small glimmer of hope, Linda Burney intervention on Sky similarly. Then, at the Victorian Labor conference this week an urgency motion calling for an end to offshore immigration detention and the transfer of all remaining asylum seekers to the Australian mainland within 90 days was prevented by a procedural move by the CFMEU. 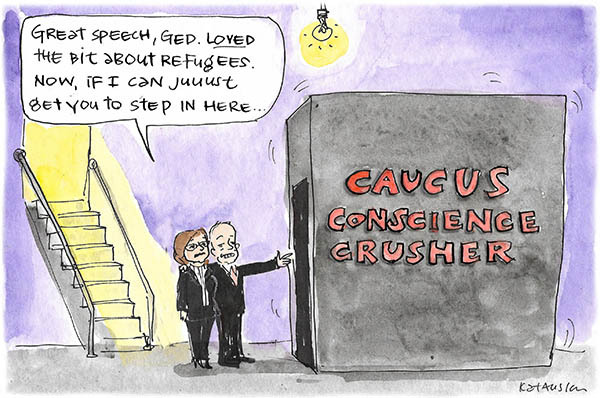 Its motive is blatant protection of Bill Shorten’s position on refugees and indicates that any major change to the party’s platform at the national conference is truly dubious. Hope dashed. The government position is, at every opportunity, to wedge Labor by using the people on Manus Island and Nauru as a football in this game of national shame. Only it’s not a game. People who deserve our compassion should not be treated as if they are less than human as the Turnbull government is so doing. Labor is equally shameful. Its cowardice in allowing Unions, or any entity within its influence, to stifle debate on this issue, deserves condemnation. Personally, I am appalled at Turnbull/Dutton sadistic policy and I am just as disgusted by Labor’s scarcity of policy. First prize to Dutton for the blame game, but he still did not answer the question. But then which politician does? The possibility of a NZ solution gives me hope, but why so long getting round to it-and if Dutton now thinks the NZ solution is ok even without requiring a visa why the change of mind? Funny how the image of Pontius Pilate comes to mind in this context of responsibility. Quid est veritas ? as he supposedly said. Thank you Frank for such a wonderful write-up. It is exactly how I think and I feel so embarrassed about this whole issue. I teach English to Refugees and Asylum Seekers every Friday and this whole comes to mind to haunt me. I just hope that there will be some change soon, very soon. I totally agree. It is a big blot on the Australian government. Another one to match the treatment of native Australians. Another disgraceful mess initiated by the Labor Party and left to those who replaced it in government to clean up the mess - not forgetting that perhaps the worst and most disingenuous Prime Minister this country has ever had, one J W Howard, is not blameless in the origins of our country's response to asylum seekers. Thanks Frank! Duton is fear-mongering and playing politiics with the lives of desperate asylum seekers. I can't wait for a change of Government. There are enough decent people in the ALP to solve this problem quickly. Seven innocent men have died on Manus Island already and there will be more if this Government remains in power for much longer! The boats have stopped and will stay stopped, so that's a red herring being used by Dutton and his cohorts! Welcome back after a long holiday, Marilyn! Thanks Frank for continuing to speak out when so many have (understandably) grown weary of the fight. So much of all this discussion centers around numbers and I wonder if anyone has done the exercise of looking at the cost of incarcerating all refugees on Manus and Nauru since they were opened and averaged it out per per person? (And extensively published the results.) If we are more motivated by our hip pocket than human rights, then costs alone should turn the tide of public opinion. You succinctly echo the thoughts, Frank, of millions of decent Australians. Succinctly argued, Frank! God Love You!